Technical Car Experts Answers everything you need: how to remove battery from norelco shaver? how to remove battery from norelco shaver? 1) Let the shaver run to discharge the old battery pack. 2) Remove 2 screws holding shaver case halves together; separate halves. 3) Remove the two spring-clips: using needle-nosed pliers, slightly bend each side of the spring clips inward (or outward, depending on model) to disengage, then lift to remove. 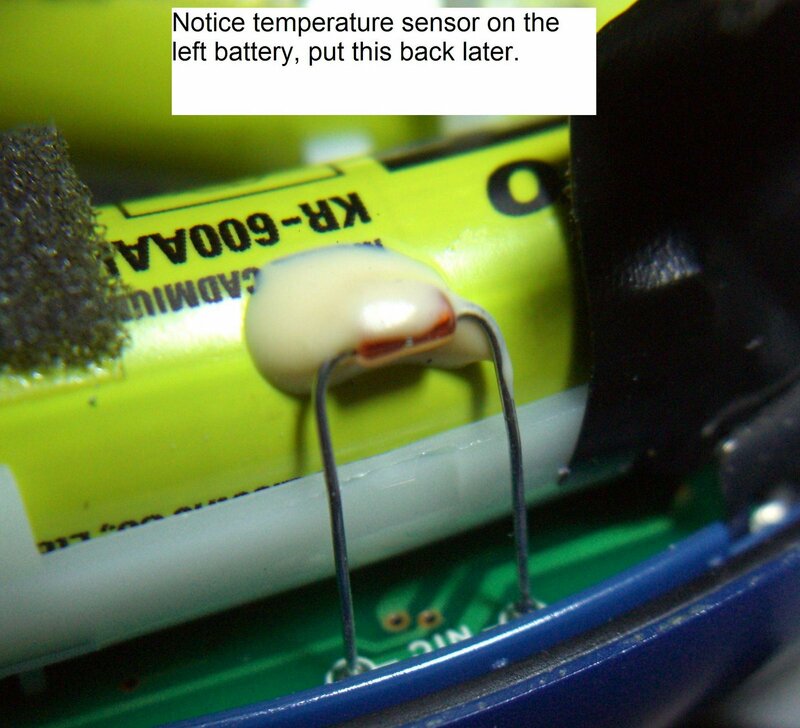 4) One end of the battery pack has two flat metal leads that pass thru the plastic cradle, thru the printed-circuit board and are soldered to the underside of the P-C board. 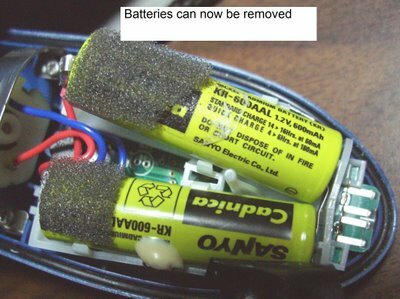 Using small electronics side-cutters, cut these leads as close to the batteries as possible and remove the battery pack. The idea is to leave as much of the metal leads as possible visible and accessible in the cradle. 6) Re-install the spring clips, screw the two shaver halves back together, charge overnite. I have a feeling this will be one of those blog entries that will generate a long tail of hits. I came to the realization that I’ve never worn out a Norelco or Remington razor yet I’ve owned a number of them over the years. But I have worn out a number of shaver batteries. My first Norelco razor was a plug-in only model. I was lured into buying a battery-powered model that would let me shave without being tethered to the wall outlet. Over the course of a year or so, I noticed that the charge on the battery wasn’t lasting very long and so this eventually became no different than the model that had to be connected to the AC outlet all the time. I bought a replacement when I was planning a camping trip and would not have dependable access to an AC outlet. Over the course of a few years, this model did the same thing, i.e., its batteries wore out and it also had to be plugged in all the time. At the time, I priced a service that would replace the batteries and figured out, like many others, I’m sure, that it wasn’t much more expensive to buy a new razor than to repair an old one. So I opted to get a Remington R9190 model that I could clean by running it under the water tap. What would they think of next? It had amazing capacity, providing 60 minutes of shaving on a single charge. However, after about 18 months, it too, needed to be left plugged in all the time. I figured that these razors only needed new batteries, but knew that it would require getting the right kind of batteries, and then having to do some unsoldering and re-soldering. I found a website that sold shaver batteries and would provide the correct ones for the razors based on their model numbers. In this case, the razor model numbers I wanted to fix were a Norelco 6843XL and a Remington R9190. I found the battery packs at Electricshaver.com. In the case of the 6843XL, I received a single AA 600 mah NiCad battery with solder tabs at a cost of $9.95. The R9190 battery pack contained a pair of AA NiCads with solder tabs that were joined together at one end. I had to cut these apart to actually install them so it probably would have been better if they just provided two AA solder tab batteries. That battery pack cost $14.95. I realized afterwards that I could probably just have just ordered 3 regular solder tab AA NiCad batteries from any of a number of Internet sources for around $3.00 each and saved about $15. Live and learn. The Norelco 6843XL came apart quite easily. I just removed two screws (although I did need to use a torx driver) and then popped its snap joints apart. The battery tabs of the single AA battery were soldered through the PC board, but with a solder sucker and some solder wick, they were easily removed and the battery was replaced. The Norelco 6843XL was easy to take apart. It contained a single AA solder-tab battery. The R9190 wasn’t as easy to disassemble. There were 4 exposed phillips head screws which I removed, but the casing still would not come apart. After a lot of time fiddling, I found that there were two more hidden screws under the rubber backing and once these were removed, everything came apart. 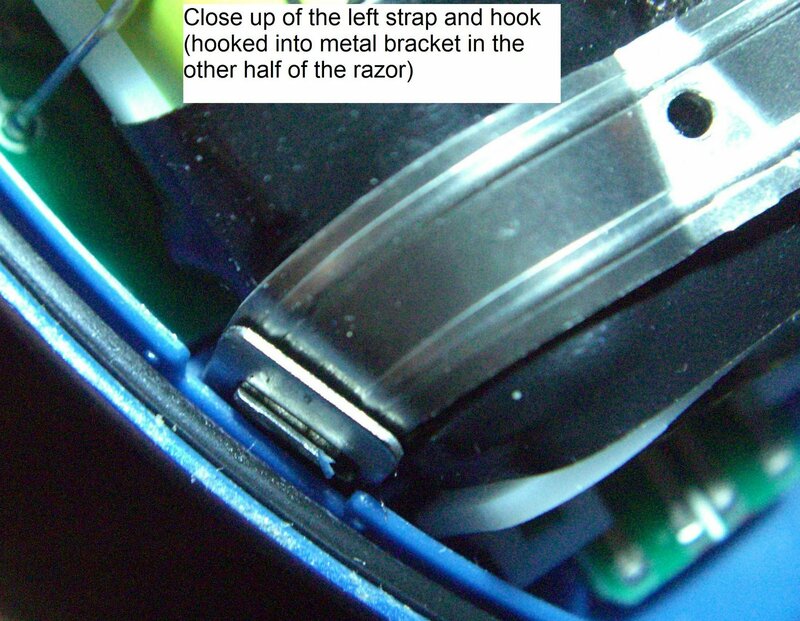 It was first necessary to pry up the corners of the rubber backing which was glued down on the back of the shaver (as shown in the photo) to expose the hidden screws. I came close to giving up on it. It’s the reason you may have found this posting, because searching for ‘Remington R9100 R9190 R9200 shaver battery replacement’ came up with nothing on the Internet. So I figure that within a few weeks of posting this, it will start to get hits because if I’m having this problem, chances are pretty good that others are as well. The R9190 had two hidden screws keeping it together. 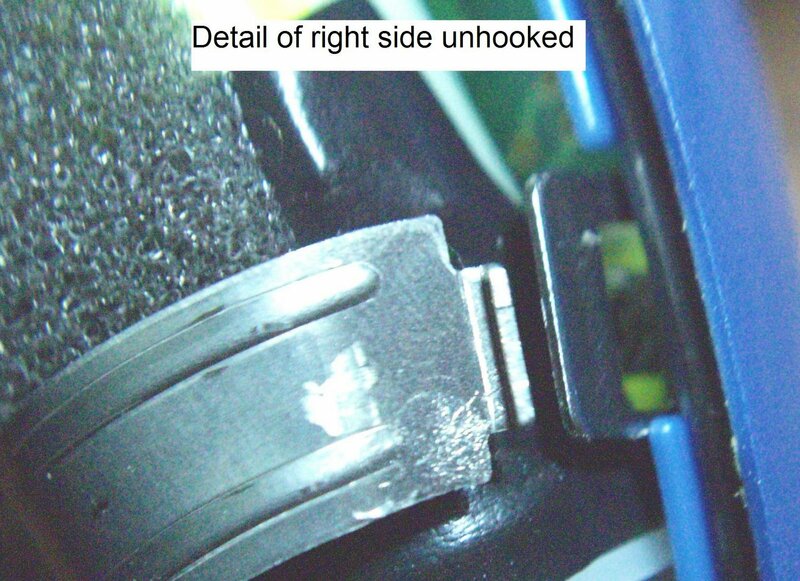 After prying up the rubber as shown in the photo, the screws were exposed. The main reason I’m posting this is because I know how much I appreciate it when I find some obscure piece of information on the Internet that allows me to fix something that I’d otherwise have to throw away. I’m disappointed that Norelco and Remington continue to build products whose batteries cannot be easily serviced. I’ve read recently that many cellphones get replaced when their batteries goes bad after around 18 months of use. I find that to be extremely wasteful, and in the case of most cellphones, completely unnecessary because the batteries are generally easily replaced (unless you have an iPhone) . Of course, the battery packs sometimes have excessive markups on them when purchased from the manufacturer so that probably contributes to it as well. I think that building batteries into a product in such a way that they cannot be replaced by an end user is unacceptable. Rechargeable batteries are only good for around 500 charge cycles and then they must be replaced. I wouldn’t want to be associated with a product where the batteries are so difficult to replace that the battery life determines the useful life of the product. The R9190 has two AA NiCad batteries soldered together with some wiring. They are relatively easy to replace once you figure out how to get the case apart. Both shavers are working great now and I can again enjoy the experience of untethered shaving. I continue to get a lot of hits on this web page so I can only imagine that many people have encountered the same problem, i.e., a razor that is still working, but with batteries that have gone flat. A very nice gentleman sent me the images below complete with annotations to show how he repaired his Remington Model 8100 razor. He replaced the solder tail AA batteries with holders for AAA batteries. 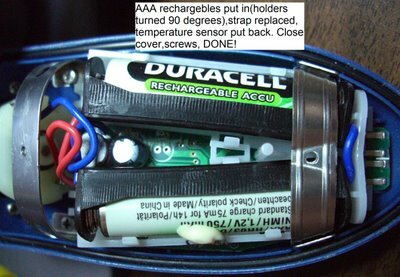 Even though AAA batteries are much smaller, and usually have half the capacity of AA batteries, he found some that had nearly equal capacity to the AA batteries he replaced. The best part of his repair is that the next time they go flat, it will be very easy to replace them because it will require no soldering. The Phillips Norelco shaver is probably the best brand of shaver made today, but its both hard to find a good quality replacement Norelco shaver battery and its also hard to fit. - The Norelco shaver was built to be waterproof , so Norelco made all the connections inside watertight so the old battery needs to be de-soldered from the main board and the new battery needs to be soldered back to the board. Having said that, the inside of the shaver cannot get water in it, but the battery connections can rust even if the tiniest amount of moisture gets inside, so they didn't take the risk and just soldered the joints, making battery replacement difficult. Norelco stopped making a replacement battery under their own brand in 2005, so other OEM batteries are available that will fit - but often the OEM quality is poor and the replacement batteries do not achieve the performance that the original Norelco battery did. The replacement of this battery is not an easy task, as it involves using a soldering iron, so when you make the battery switch, you really only want to do this once - thus the need for the best quality battery cell. To protect themselves from lawsuits and provide their dealers with work, Norelco states that you must take your Norelco shaver to an authorized dealer who will replace the battery for you. We went to the official dealer in New York City and they charged $68.22 +Tax = $73.84, which clearly is ludicrous because this Norelco shaver can be bought for around $50.00 brand new. What Norelco is really saying is that all their battery shavers should be thrown in the trash when the battery is dead, which is clearly an environmental mistake. 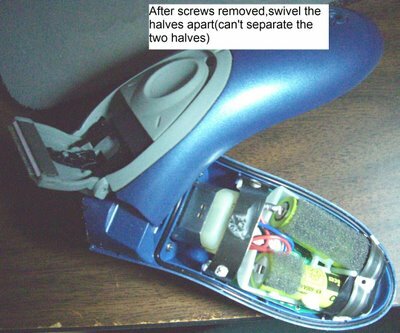 With a little bit of focus you can change the battery in Norelco shavers, but it will violate the warranty on the product, but as the product isn't working anyway, there is no loss. The bottom line is that Norelco should have made it easier to change the battery in the first place, a little bit of an improved design would have meant that the Norelco shaver can live for years - bad news for them trying to sell you a new shaver. The OEM batteries available on the market that will fit the Norelco shaver are sadly using 1980's technology, IE they are NICad batteries, it seems that it would be a lot smarter to replace the standard NiCad battery with a NiMH battery or even Lithium - Unfortunately, no aftermarket OEM manufacturer makes a battery that will fit the Norelco shaver and it appears that Norelco have designed the circuitry of the shaver to only handle the charging pattern of a NiCD battery, unconfirmed rumors abound that the shaver will actually explode if your try to retrofit a NiMH and Lithium battery cell in this shaver. Even more progressive thinking would be a battery replacement that did away with the soldering for ever, by replacing it with a connector that allowed you to replace the battery in the future without using a soldering iron, again no manufacturer has yet created this retrofit product which is an awful shame. The NiCd Battery pack comes with solder tabs that must be soldered into position using a fine point soldering gun . The battery pack is comprised of two batteries connected together as pictured. 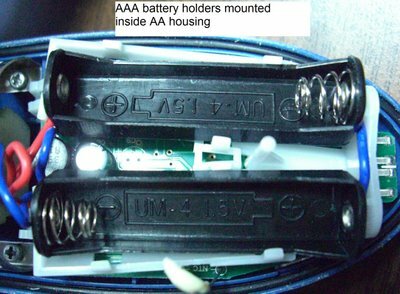 The battery pack is actually two batteries connected together as pictured below .Each individual battery is 1 7/8" long and 9/16" diameter. Most batteries on the market are unbranded, which usually means that they are the standard 600mah battery that doesn't' have much lasting power. Our battery is a far superior to the 600mAH by coming in at 800mAH, but it still suffers from the memory and degradation that all NiCD batteries have, so it will run well for a couple of years is you look after it. It also fits Norelco models: 605, 650, 825, 835, 875, 885, 905, 915, 955 Fits models 985, 965, 5865, 5885, 5887, etc. This battery pack will last a couple of years of heavy shaver use and then you have to go through the whole rigmarole again, but its the best quality that we could get from a manufacturer, still far superior to competition, but still not good enough we know. Yes, there is such a thing as a "Single A" Battery and its a little bit larger, but if you dump the battery tray you can use 2 of this slightly larger battery, which will actually last a lot longer - They make the "single A" Battery in up to 1700 mah, which means nearly 3 times the amount of power than the original or replacement battery. The install is even trickier than the AA replacement battery install, but its well worth it if you have the time and patience - It really will supercharge you Norelco shaver - lets be clear, the shaver will still operate at normal speed, but the battery juice will last up to 3 times longer than when your Norelco shaver was new. Here's a YouTube video on the right on how to do it. Suggest full screen so you can see the intricacies of the install. Shouldn't someone actually be doing this for a job, seems to me that a lot of people would pay for it. 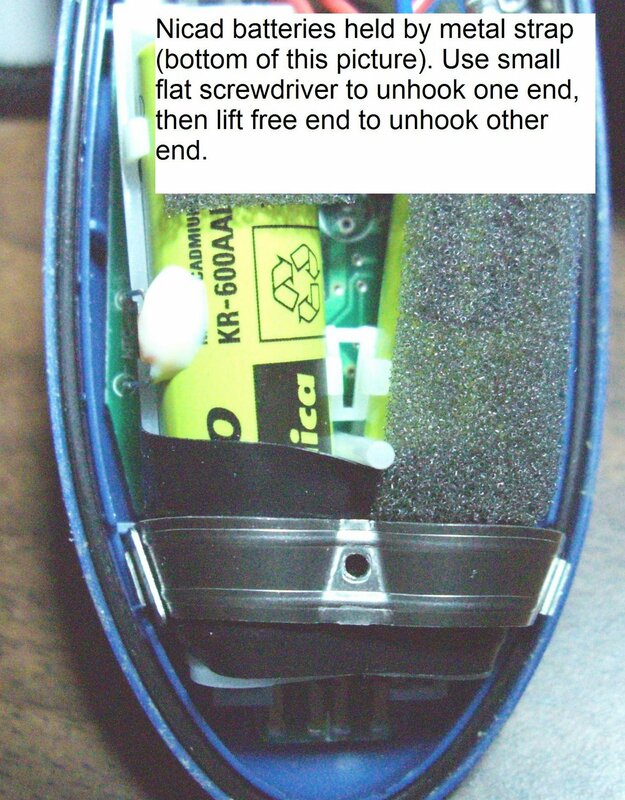 Some tips on making this (and any other NiCd battery) last longer is to not charge it until its empty, don't overcharge it - i.e. keep the shaver on the charger, don't shave while plugged in (unless the shaver is completely flat of course) and perform a full discharge and recharge once-a-month. The NiCD technology is ridiculously bad, but if you want the battery to last you have to jump through these hoops to keep it alive before its time for another solder operation. Labels: how to remove battery from norelco shaver.